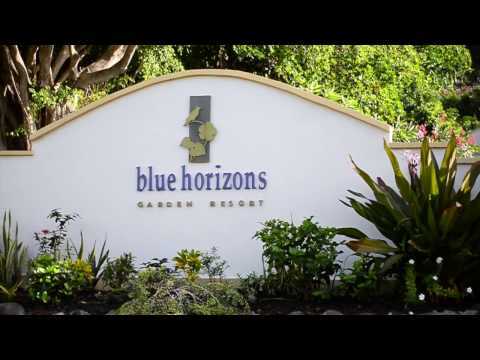 Blue Horizons Garden Resort is a family-owned, environmentally friendly, self-catering resort, located 300 yards from Grand Anse Beach. A quiet haven for visitor relaxation, it is also home to 27 species of indigenous birds — so don&apos;t forget your binoculars! Enjoy ocean views from La Belle Creole Restaurant featuring a continental West Indian cuisine or a tropical beverage from Aqua Pool Bar. Situated on the southwest coast of Grenada, 300 yards from Grand Anse Beach and 5 miles from the city of St. George’s. Transfer time from airport: 10 minutes. 26 suites and 6 studios with garden view or terraced hillside with ocean views. All with private balcony/patio, air-conditioning, ceiling fans, WiFi access, cable TV, telephone, kitchenette, safe, iron and board and hairdryer. Superior Studios have private patio and 1 king-size bed, sleeping maximum 2 adults. Breakfast and Half Board options: Available at a supplement. One-Bed Deluxe Garden View Rooms are on a lower level, with a private patio and separate living room and dining area. With 1 king-size bed or 2 queen-size beds and pull-out sleeper sofa, sleeping maximum 3 adults or 2 adults and 2 children. One-Bed Deluxe Ocean View Rooms can be found on a higher level (stair climbing required), with separate living rooms and dining area. With 1 king-size bed or 2 queen-size beds and 1 twin sleeper sofa, sleeping maximum 3 adults or 2 adults and 2 children. Kids stay free: up to and including 16 years, when sharing a room with one or two adults. La Belle Creole Restaurant & Bar, Aqua Pool Bar & Grill. Additional dining within walking distance. Swimming pool, lounge/library, board games, birdwatching, children’s playground. Complimentary non-motorised water sports, beach lounges 300 yards away on Grand Anse Beach. Spa*, fitness centre*, yoga* and entertainment within walking distance. Complimentary golf green fees. Complimentary WiFi in rooms and public areas. Business Centre. Babysitting* (24-hours notice required). Laundry service*. Room Service*. Please note: This property may be unsuitable for some customers with mobility challenges. Please note: Breakfast and Half Board options are available at a supplement. Stayed here for a week on business. What an awesome experience. Crystal blue pool, immaculate rooms. As peaceful a retreat as you could ever want. Walking distance to mall. Staff was the best on the island. Attentive and courteous at all times. Truly a gem. I’ll be returning for sure.